In many coastal cities increasingly dense automobile traffic has spurred the demand for water transportation and created a need for new high-speed passenger vessels. And, in countries like Thailand, Malaysia, the Maldives, and Indonesia, many island resorts require water transport from the mainland. Those vessels should match the luxury of the resorts they serve, without requiring large investments. 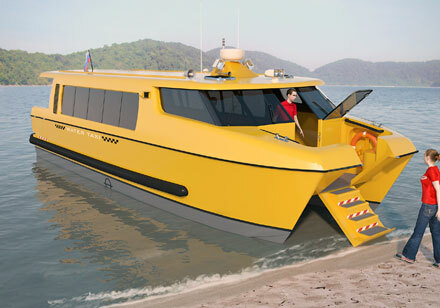 A water taxi or small passenger craft on a catamaran platform is a possible solution that our Thailand-based design office of Albatross Marine Design is pursuing. Our office has an extensive record developing 19.6′–78.7′ (6m–24m) catamarans, and these boats are currently in service as passenger craft, dive boats, and pleasure boats in many locations. In designing the new Sea Van, or ASV1100, a modestly proportioned (36.25′/11.05m) passenger catamaran, we tried to meet requirements for stylish, functional, and safe craft to bring high-speed transportation to a new level. Lower vertical accelerations, 30%–50% less, than those of a monohull with similar passenger capacity. 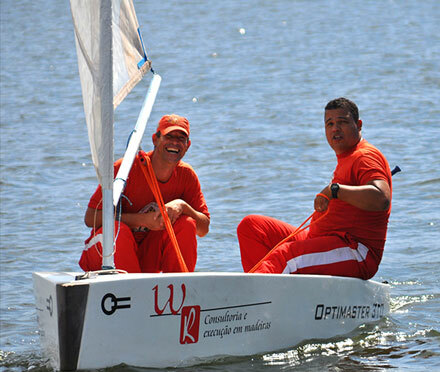 The catamaran’s lower accelerations mean that smaller boats than a comparable monohull can meet the transportation need, or that a cat of similar size can maintain higher speed for a given sea state. 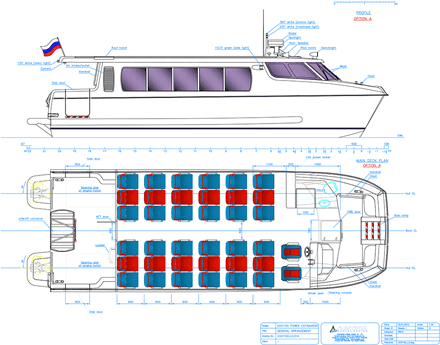 For vessels with the same passenger capacity, catamarans offer about 40% more saloon area per passenger, so accommodations are more comfortable. Arrangements on the ASV1100 are simple: a passenger saloon with forward-looking seats grouped into six rows of three seats each on both sides of a central passageway. The designers followed the ergonomics and dimensions of economy-class aircraft cabins, but left a bit more space (35″/900mm) between the rows. The steering station is located to starboard in the forward end of saloon with a console and seats for the crew of two. A small head is necessary for trips longer than two hours, so we included one adjacent to the helm station in the port bow section. Aft is an open deck that accommodates passenger boarding through side doors. Side windows can be of the sliding type that allows excellent airflow and protection from rain. Forward are broad, angled windscreen windows and a central weatherproof door that provides bow access for the crew and can be used by passengers for boarding. The bow of the Sea Van can be fitted with either a folding bow ladder for beach boarding, or a bow ramp for dock boarding. Once lifted, the ramp becomes an integral part of the deck between the hulls. The saloon can be air-conditioned, an essential feature in the tropics. ASV1100 hulls are typical planing catamaran forms with sharp chines, chine flats, and slightly wrapped bottom. The hulls are symmetrical, which has proved to be an efficient shape at displacement and early planning-speed range. The basic design of ASV1100 is for propulsion with sterndrive units on Volvo D6 engines. Other engine options and drives including shaft drives and sterndrives are available by making simple modifications to and inserts in the mold. Select to view high-resolution PDF. Hull structure is designed for fiber-reinforced-plastic (FRP) construction with PVC-cored panels for bottom, sides, deck, wet deck, and superstructure. In general, the boat structure is designed following the ISO 12215-5 Small Craft standard, which we find works well for commercial craft shorter than 49.2′ (15m) and is officially accepted for such craft in a number of countries. The bottom is cored with Divinycell H130 foam, and the rest of structure with H80. Laminate skins are multiaxial fabrics and polyester/vinylester resins. Areas vulnerable to tear damage are protected by stainless steel plates. Bow sections below the waterline are filled with foam to form a collision block, a solution that has proved to work well. Hull and deck structures in the engineroom are protected by fireproof mats approved for use with FRP sandwich structures. In some jurisdictions, such small passenger craft operate in a kind of regulatory gray area with no specified requirements. As a result, requirements for bigger craft are commonly applied, leading to a number of compliance problems. Depending on the jurisdiction, additional components such as advanced lifesaving and navigation equipment might be needed and can be added on demand. 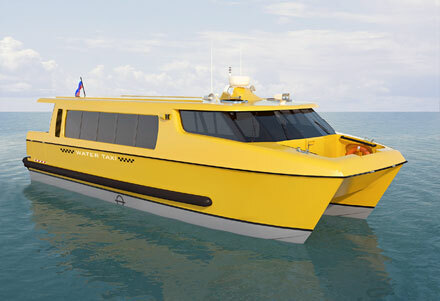 ASV1100 is currently being developed for the Southeast Asian and Russian markets.